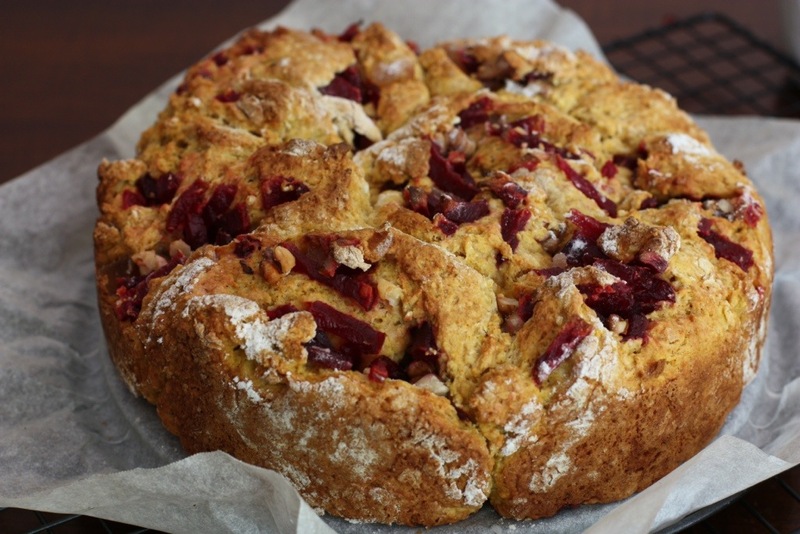 The basis for this cake is Lady Florence Bjelke-Petersen’s Pumpkin Scone recipe. Politics aside, Lady Flo’s Pumpkin Scones are a Queensland icon. They’re really somewhere between a cake and a scone. Usually when I make it I add sultanas and walnuts but when I read that the theme for the November Sweet Adventures Blog Hop was Cake & Three Veg I wanted to be involved; it’s such a great challenge. So this time I’ve added beetroot which complements the pumpkin and gives it a lovely earthy flavour and since it’s not too sweet it feels like a healthy treat. 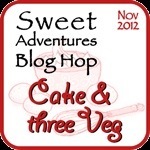 If you want to see other amazing vegetable based sweets then visit the website for this month’s Sweet Adventure Blog Hop host, 84th&3rd or click on the SABH logo below. 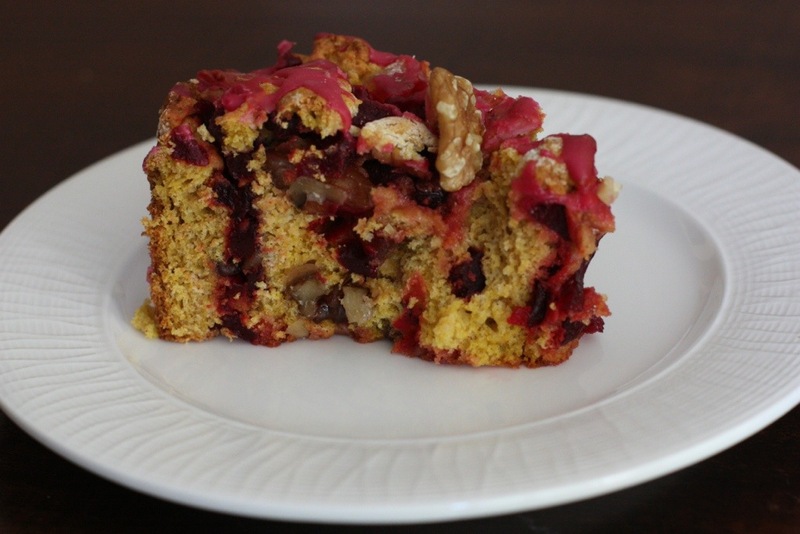 For this cake I used a filling of candied beetroot, 1/4 cup crystallised ginger (chopped) and 1/2 cup walnuts. The candied beetroot takes a little time, but not much effort, to make. It can be done several days in advance and stored in the fridge until needed. Place the water and sugar in a saucepan. Heat, stirring occasionally, until the sugar has dissolved and the syrup is gently simmering. Add the beetroot and let simmer until it is soft and slightly translucent. The amount of time this will take will depend on how big the beetroot pieces are. I cut the beetroot into smallish batons and it took about 30 minutes. Strain the beetroot and reserve the syrup. Store in the fridge until needed. Preheat the oven to 200C/400F. Line the base of a 20cm/8 inch springform tin. In a standing mixer, beat the butter, sugar, spice and salt until creamy. Add one egg and mix until combined. Add the mashed pumpkin and mix. Add the flour and lightly mix using a spatula. Tip the dough onto a lightly floured work surface and roll into a rectangle. Spread the filling over the top, leaving a border of about 2.5cm/1 inch. Roll one long side towards the other until it forms a log. Chop into six pieces and place, cut side facing up, in the tin. I finished this cake with a simple glaze made of about 1/2 cup icing sugar and a few tablespoons of the reserved beetroot syrup. Scatter a few walnuts over the top. Posted in Cakes & MuffinsTagged Lady Florence Bjelke-Petersen, Queensland, SABH, Sweet Adventures Blog Hop, Vegetables, vegetarianBookmark the permalink. Great recipe and I’m glad you like the theme. This is like a combo of scones and scrolls in one, love it! Thanks for hosting the blog hop. It’s such a fun challenge and I am looking forward to seeing what everyone else does. It’s a slippery slope Steph – Lady Flo’s scone could be the gateway drug to the right wing! Lady Flo’s scones were the inspiration behind this? Amazing. What an interesting recipe you’ve come up with here! Wow. I love the idea of candied beetroots 🙂 Looks amazing! Thanks Monica. The candied beetroots weren’t over-the-top sweet. They still had that lovely earthy beetroot flavour. 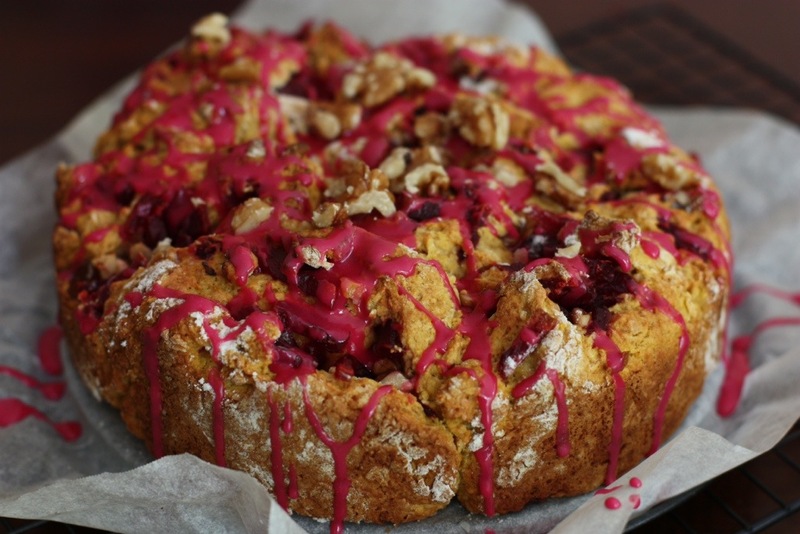 I love the rustic look of this cake and the candied beetroot is such a great idea. This looks gorgeous! I can’t believe I’ve never made candied beetroot before. I’ll have to rectify that! Thank you! Have fun with the candied beetroot. I look forward to seeing what you do with it.